Here’s a classic pose. I love the look of the old school PR photos like this. If you look carefully you can even spy a crane in the background erecting one of Austin’s first ‘skyscrapers’. Originally wanting to go to Notre Dame, the Golden Domers told Henderson he was ‘too fat’ to play for them, so he decided to go to Texas. 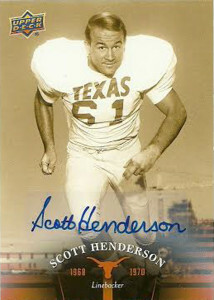 Scott went on to become one of Texas’ great linebackers of all-time, and was co-captain of the Longhorns 1969 and 1970 National Championship teams. Henderson ended up with 181 tackles in his college career, and earned All-American Honors in 1970.